Paul McCartney is convinced that John Lennon haunted the recording of the 1995 Beatles single “Free As A Bird” – in the form of a white peacock. 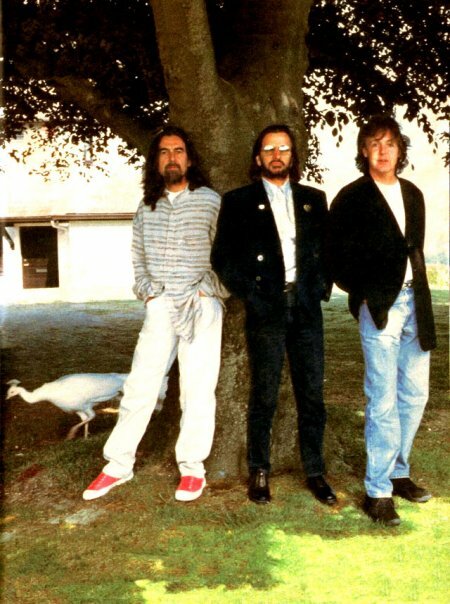 McCartney, Ringo Starr and George Harrison were posing for a photograph outside the studio where the track was recorded when a rare white peacock wandered in the shot at the last minute. “Free as a Bird” is a song originally composed and recorded in 1977 as a home demo by John Lennon. The Beatles then made a studio version of the recording, incorporating contributions from McCartney, Harrison and Starr. 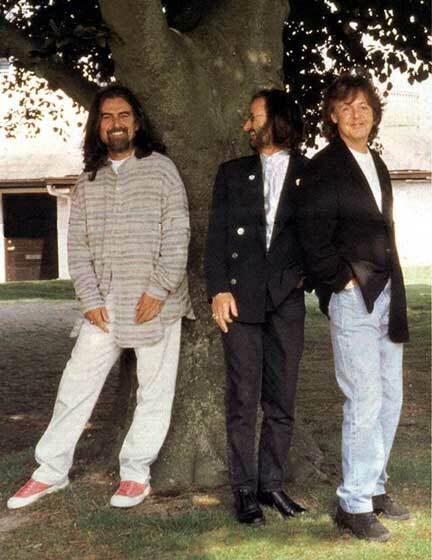 The song was released the week of the 15 year anniversary of Lennon’s death on The Beatles Anthology 1 record so it makes sense that the presense of Lennon was felt in the studio and during photo sessions. Fast forward to the end it happens at around 4;30…. Is this for real? From what I know Paul has (or used to have) white peacocks in his family compound at Sussex. And wasn’t Free as a Bird recorded at Paul’s home studio? Now that I had rewatched the Anthology Bonus DVD, I am convinced that these two photo shots were not taken during the recording of “Free As A Bird,” but rather, they were taken at Paul’s studio at his family compound at Sussex, during the recording of “Real Love” a year later. And I am quite SURE that Paul had a couple of those rare white peacocks in his Sussex home’s garden by 1995. NOT to say that one of them couldn’t have been possessed by John’s spirit….